October is the National Trust Walking Festival which is a great opportunity to celebrate some of Britain's most beautiful locations. Although many of the properties close during the Winter, much of the land is open all year around and ViewRanger has some excellent recommendations for good walks. Here are a few of the best walks near National Trust properties in the East of England. These walks are all based at either National Trust properties or land, celebrating the great work the National Trust does to protect British heritage and culture. The walks can be downloaded via the ViewRanger App onto a smartphone or tablet to carry with you. Or why not create your own route to follow. Sutton Hoo is located near Woodbridge, north east of Ipswich. The estate itself is 255 acres and home to an ancient royal burial site. The award winning exhibition features a reconstruction of the burial chamber and treasure that once belonged to the Anglo-Saxon king buried here. The guided tour really brings the story of how it was discovered aiive but if you prefer to walk at your own pace the Sutton Hoo - Methersgate Hall - Sutton Common - Sutton Hoo walk is available. Submitted by walkingworld it is an 8.5 mile walk, taking in the burial ground, RAF base at Woodbridge and even Rendlesham Forest – reported to be the site of UFO activity! Anglesey Abbey is a Jacobean-style house with gardens and a working watermill, situated to the north east of Cambridge. With fantastic furniture, galleries, gardens and temples to explore. 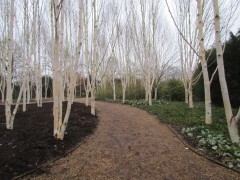 The grounds are particularly good during late Winter when the snowdrops are in bloom. The Anglesey Abbey walk, uploaded by Anne Dockerill, is a short 2.6 mile circular walk around the grounds of Anglesey Abbey. The walk is free to download from ViewRanger and boasts some excellent photo opportunities, particularly as the autumn colours begin to take over. Sheringham Park on the north east coast of Norfolk, has been a favourite for rhododendron lovers for over 60 years. But at this time of year it is the coastal views that really make Sheringham Park a great venue for a bracing walk. Walkingworld.com’s Sheringham Park walk features woodland, coastline views and the North Norfolk Steam Railway. The walk is a 5 mile circular route, which can be downloaded from ViewRanger for 100 credits. There is a regular bus along the coastline which is excellent for walkers. Moving further south down the coastline, Dunwich is a reserve that offers a true sense of peace. The area is not just home to birds, but also red deer and ant lions, living amongst the acres of pink heather. The Dunwich Gorse walk has been recommended by National Trust members and is a 2.5 mile circular route. The route also has excellent views of the coastline and is particularly good for those that want to get some healthy sea air into their lungs! The walks featured here have highlighted the variety of countryside we have available to us in East Anglia. We hope by going out and making the most of the National Trust sites nearby, you will appreciate the fantastic work they do. Supporting the National Trust will ensure we have these beautiful places to enjoy in the future. If you want to share your favourite walk, please use the tools in my.viewranger.com.